BWoody Gain - 786.9 CFM!!!!!!!!!!! NOTE: May require a custom tune for optimal performance gains. // Disclaimer: This product is for intended for off road use only. Our IAT MAP Harness is used to prevent an intake over temperature code. IAT Harness retails $89.95 - Original purchasers of this intake can call to order harness seperately if needed. Designed so that the opening at the front of the shield will capture the incoming cool air while the angled side towards the rear of the shield will help evactuate hot air downward from your engine bay. Effecively lowering IATs approximately 2-4 degrees under normal driving conditions. Due to demand, this item may take 3-7 days to ship. This is the whine you're looking for! 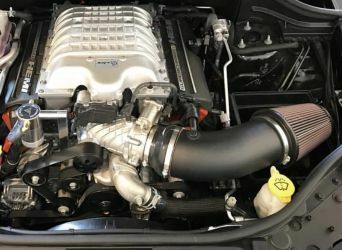 This CAI gives you that sweet sound of supercharger whine with a quality built and sleek looking form factor. Highly recommended for quality and performance! This thing screams like you wouldnt believe, Videos do it no justice. Highly recommend!!! Awesome Intake!! My Super Charger SCREAMS! Easy Install, Great Customer Service, and sounds bad a**!